to keep track of staff vacations and absences from work. 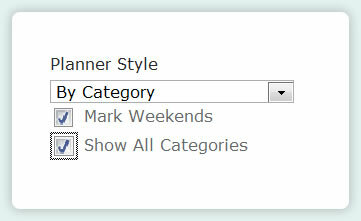 Open the webpart configuration panel and under Planner Style choose either Classic or By Category. 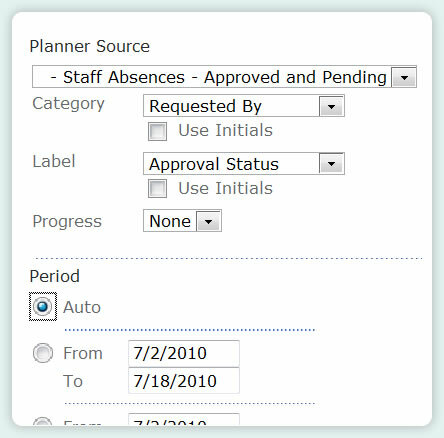 If you choose a Category view, checking the Show all categories box will ensure that all staff members are visible on the chart, whether they have absence booked or not. In Planner Source choose the relevant list, for Category choose the column which contains your team members names. If you are using approvals set approval status for your labels. When setting up the time period for Planner to display, choosing the Auto button will allow Planner to display the most appropriate time period and scale, based on the items it finds in your list, whilst still allowing you to scroll back and forth and zoom in and out if you wish. See how to use Planner in conjunction with Reminder and PivotPoint to set up a full Staff Vacation Planning System in SharePoint.